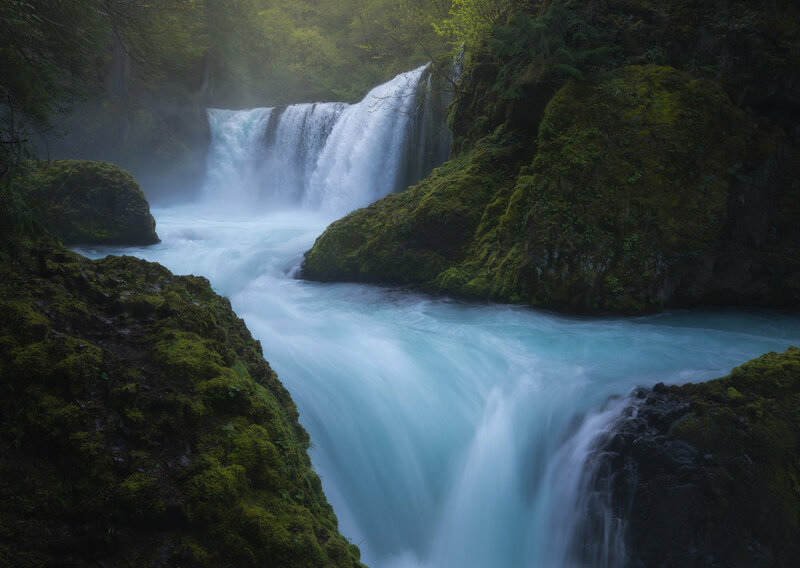 In this workshop we are going to be exploring some of the majestic waterfalls of Washington state as well as the wildflower filled valleys of the Columbia river gorge. The Oregon side of the Columbia river gorge is known for its impressive array of waterfalls, and because of that, it is flooded with tourists. The Washington side however has some of the most beautiful waterfalls, with only a fraction of the visitors. Because of the effort involved to visit these wonders of nature we will often have the locations to ourselves or have very few people at each location. This will be a very small close knit group. I am only accepting 8 participants on this trip. This will give us elbow room at our locations, and give anyone that wants 1 on 1 help in the field more time with me. Each morning we will be waking up early for sunrise where we will be photographing fields of wildflowers over the Columbia river gorge. We will then load up and travel to one of the 5 large waterfalls we will be photographing on this trip. After lunch we will then go and photograph more wild flowers and scenic vista's for sunset. This will be one of the more challenging workshops I have lead in the way of physical requirements. Some of the waterfalls we will be hiking to are fairly challenging to get to. The trails will be very muddy and slick with a very steep decline going in, and steep coming out. There are places where there will be ropes to assist us.. and other places where we wish we had them. There will also be times when we will want to wade out in to the streams to find better compositions. The longest hike will be around 3.5 miles round trip, with about 700 feet of elevation gain. For these reasons I need to make sure everyone that signs up feels confident in their hiking abilities and physical capabilities. I am a large guy and I am able to do these hikes, but trust me I am going to be feeling it by the end of this adventure doing all the hikes in consecutive days. By attending this workshop, you agree to hold Nick Page Photography harmless for all personal injury or loss that may occur during or in connection with this trip. Should the instructor (Nick Page) become ill, injured or otherwise become unable to fullfill his duties he will either provide a fill in instructor, or provide a refund of payments made. Do not push your physical abilities past what you are healthy enough to do. You are in charge of deciding if a location is safe for you to travel to. Nick Page Photography's only role in this workshop is to teach photography and help you find great locations. You are responsible for your safety as you travel. Nick Page Photography makes no effort to vet the other attendees of the trip and you need to make sure you are safe in their companionship. In the event of extraordinary events, governmental instability, extreme weather, or other condition, Nick Page Photography reserves the right to cancel this trip and return all workshop fees to participants.